I just wanted to wish everyone a very Merry Christmas. I am watching The Yule Log on Antenna TV, just started the 4th hour. The WPIX broadcast starts in aboutg an hour. We got a tiny bit of snow, so it is a White Christmas. This is my Christmas Tree this morning. I have over 125 C7 Lights on the tree this year. 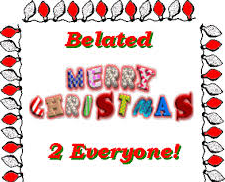 Hoping everyone is truly blessed with The Christmas Spirtit today and every day. Remember that Christmas isn't just a day in December, it is a way of Life. It isn't just about the giving and receiving, , it is about the Love for one another. Merry Christmas to all, hope everyone is having a wonderful Christmas, the Yule log was on this morning while my kids were opening gifts , what a great day , for me the Yule log brings many many great memories of growing up in Brooklyn and Holidays with my family, god bless you all. Nerry Christmas to all on the Yule Log Message Board! We too had the yule log on courtesy of WPIX's Facebook page using Chromecast to get it to our TV. Always pleasant to open gifts with it! I have a 2hr copy of it but there is something special about watching it live! The C7 lights were the best. The miniatures just don't have the same punch that the C7 and C9 bulbs did. And the blow mold fixtures were the best too; much better than those inflatable fixtures. 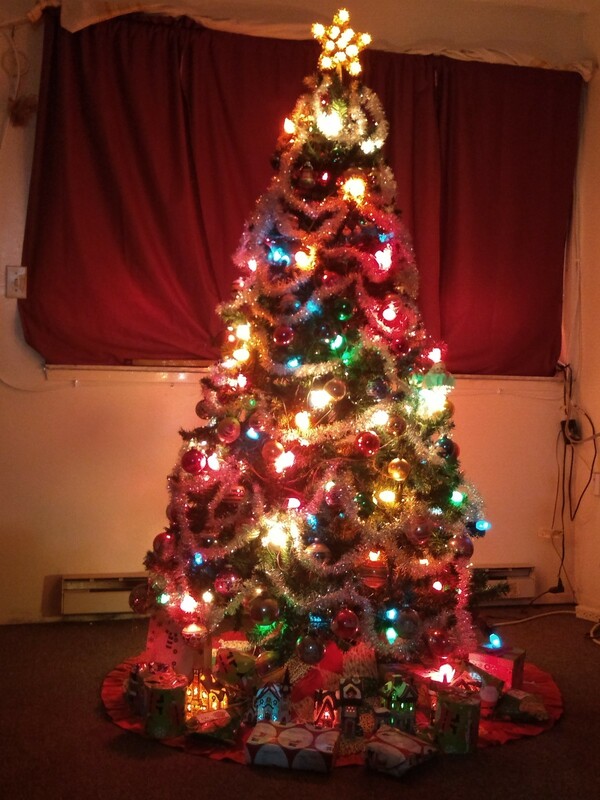 Beautiful Christmas tree, Susan! Hope you had a wonderful Christmas! I was watching The Yule Log while having breakfast, Thomas' Cranberry English Muffins and coffee. I wouldn't want it any other way! I like the C6 incadescent bulbs too, but they got very hot compared to the C7's. I also loved the C9's that had a bit of a swirl to them. The colors of the C7 and C9's from yesteryear were much better. Purer and more colors than the standard Red Blue Green White and Orange. The LED's have more colors, but they don't have the prrity of the glass incandescent lights. I also agree that blowmolds were far better than the inflatable ones that are out there today. I saw a dragon at somoene's house last week and 10 foot trees, etc. A dragon just doesn't fit into Christmas and a lot of the other inflatables either. Mike (log_fan) I was watching the Antenna TV broadcast and at 9 AM switched to WPIX and had that on for 4 hours while cooking my turkey. I was confused about the 1966 footage that was supposed to be on WPIX at 4PM because I had seen a few different post about this, and it wasn't showing up in my guide for WPIX so if it was on, I missed it and also missed DVR'ing it. I do have previous years DVR'd though from WPIX and Antenna TV. Yes, it was indeed broadcast yesterday afternoon; but the control room erroneously began the program 3 minutes early at 3:57pm. So even if you had DVR'd it, you would have missed the beginning. Oy vey, it was just par for the course this Christmas. Usually, this special 1-hour presentation of the original 1966 Yule Log is broadcast on Christmas Eve night, which is where it really belongs. However, last year I actually wish they had indeed broadcast it Christmas Day afternoon like they did this year, because I'll never forget that it was playing on the TV that night on the 24th at 6pm when my mother was admitted into hospice. It was a surreal and wistful experience to say the least, and making for a tough Christmas this year. I usually set my DVR to start 2 minutes early and end 3 minutes late being the time from whomever a TV provider may be off by a couple minutes. Also TV providers retransmit on a delay from the actual Over The Air brodcast. For example, I receive most of my local channels with Dish Network, but also receive them Over The Air, and there is at least a 40 second delay from what I see OTA and what I see on Dish Network being the signal has to be uplinked to the satellite from my local stations then retransmitted back to my receiver. My mother has been gone almost 23 year and though she passed in June, it is still very hard this time of year. I am grateful that I still have the memories though, and somehow The Yule Log helps me though it all.